Syvota, Threspotia – the ‘island’ on the mainland. The Epirus region in northern Greece is considered one of the most beautiful regions in all Greece; the village of Syvota and its surroundings are truly the jewels of the area. The pretty harbour still maintains its classical fishing village character, while further on up and down the coast, rocky coves and sandy beaches invite you into the Ionian’s turquoise waters. The views are spectacular; look across two small offshore islands to the larger islands of Corfu and Paxos, with a backdrop of densely wooded mountainsides. This unspoiled area is just perfect for a wonderfully relaxing holiday! Syvota by night feels just right. Not too quiet and not too crowded, there are little shops, good quality tavernas and bars for all tastes, plus visiting flotilla craft to add a bit of a buzz to the waterfront atmosphere. The nightlife here revolves more around relaxing with old friends than dancing till dawn, something which is clearly appreciated by the select band of loyal visitors who return year after year. Truly discover this amazing region by joining us on a guided bike ride into the town. You could also walk to one of the nearby beaches, of which there are many to explore! We’ve organised a trip by boat around the inshore islands, stopping on the way at deserted beaches for some swimming, lazing in the sun and snorkelling. You’ll love it! Back at Mega Ammos beach, we’ve lined up a selection of paddle boards for you. Once we’ve shown you the basics, you’ll be able to take them out whenever you like. Paddle boarding is a great way to improve your fitness levels while getting a whole new perspective on the world, seeing it from the water. 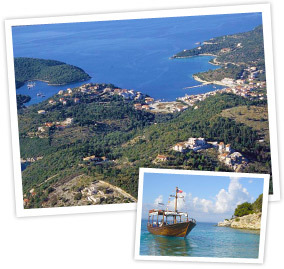 Syvota is another unspoiled, laid-back fishing village in an area of outstanding natural beauty. With a traditional natural harbour and enchanting beaches and rocky coves stretching both sides, Syvota is the perfect location for a relaxing and healthy holiday.